Arunachal Pradesh CM Pema Khandu speaking at the event. Chief Minister Pema Khandu on Saturday said the State government is determined to demolish the institutions of corruption that has existed for long in the system. 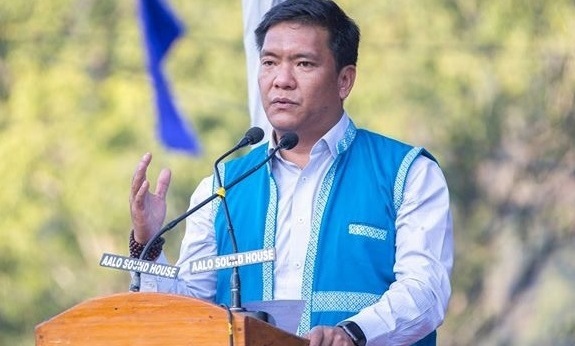 “I have to report to the Prime Minister’s office on my government’s performance and on any shortcomings that has to be improved in every two months,” Khandu said. The chief minister said since attainment of statehood, Arunachal Pradesh has never seen government coming so close to the people as we see today. “Due to rigorous campaigns unleashed by the state government, people are becoming more aware about the schemes and policies of the government and coming forward to avail its benefit in large numbers,” Khandu said. He said under Sarkar Aapke Dwar camps, it is now the government offices that are reaching to people at their doorstep and not the other way round. Speaking on development issues of the area, the chief minister a separate airport for Siang belt will be worked out soon and promised to create a divisional commissioner (Central) by this year. He informed that road from Aalo DRDA office to Darka of Rs 10 crore has received immediate approval at RE stage.